Fresh player likenesses – or, to give them their official title, starheads – in FIFA are always a big deal. Particularly when it comes to the annual November update, which for FIFA 18 sees 53 brand new faces added to the game, along with six updated ones: Giovinco, David Silva, Andros Townsend, Raheem Sterling, Hugo Lloris, and Neymar. Their loan import from the Bundesliga is one of many exceptional Huddersfield scans – to the point that I had to limit myself to three Town players on this list so it wasn’t dominated by a single team. Also worth a look are Philip Billing, Martin Cranie and Collin Quaner. The Chelsea youngster is no relation to namesake Raheem, but has earned comparisons regardless with excellent performances on the wing at youth team level. He’s since converted to right wing-back, and recently made his first-team debut in the EFL Cup. Named Newcastle captain over the summer despite his tender age of 23, Lascelles has been one of United’s most impressive performers on their return to the Premier League. Also newly added are striker Joselu, defender Jamie Sterry and keeper Karl Darlow. While the new update is Premier League focussed, Glik finally gets a proper starhead to tie in with ambassadorial work carried out for FIFA in his home country of Poland. Milan striker Andre Silva receives the same treatment after promoting the game in Portugal. Replete with hair in a bun and customary white wristbands, the Cameroonian full back is one of the best new likenesses in FIFA full-stop. EA has perfectly nailed his gangly running style, too. Nothing spectacular about the Scotsman’s likeness, but he merits a place here given that Palace fans have campaigned for two years to get his face in the game. Luka Milivojevic and Sulley Kaikai are also added. The award for best likeness of all among the new 53 must go to United States international Williams. No only is his neatly coiffed hair rendered perfectly, so too are his inimitable neck and arm tattoos. 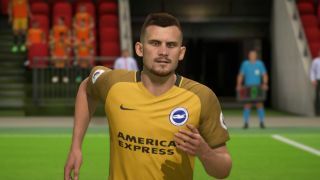 Albion’s summer signing from Ingolstadt has been the Seagulls’ star player so far this season, and if his current form continues he’ll soon have an in-form Ultimate Team card to match this true-to-life starhead. Like Williams, the Portugal international’s starhead doesn’t only impress for its facial accuracy. His much-discussed teardrop tattoos, which he’s repeatedly and steadfastly refused to explain, also find their way into FIFA to the first time. In contention for best new face alongside club mate Williams, the Beninese forward’s two-tone hairstyle and ‘tache-beard combo are captured perfectly. On the pitch he’s far better than a 76 overall rating suggests, too. An unnerving presence down either flank for both Brighton and opposition fans alike, the Czech wingman’s slightly scary demeanour is spot on. Other Albion players worth a look are defender Lewis Dunk, keeper Mat Ryan and midfielder Beram Kayal. Want all of the above players in Ultimate Team? Then use our extensive FIFA 18 coin-making guide to ensure you have the funds to purchase the lot.